Are you looking for a gutter system that is more in tune with the architecture? Perhaps your home already has copper gutters and leaders and you need to match or repair them. “Copper gutters” provide homeowners the opportunity to dramatically increase the charm, and appearance of their homes, adding sophistication and a functional necessity. Many older homes here on Long Island still have their original, copper gutter systems. Architects still love the art and sculpture, copper gutters provide, adding handcrafted leader heads to personalized copper rain chains, copper gutter systems become an admired feature of the home, providing a lifetime of enjoyment and are a delightful conversation piece. Homeowners who have copper gutters and downspouts installed on their homes rarely regret this decision. Make no mistake copper gutters and downspouts are much more expensive than seamless aluminum gutters or galvanized steel gutters. Copper gutters do however have some unique qualities that make them exceptional. Much like seamless aluminum gutters, copper gutters are designed with a seamless appearance and the soldered joints help to prevent leaks. Creative Seamless gutters and Siding Certified Installers are fully experienced in copper gutter repair and seamless copper gutter installation, helping you to upgrade the exterior of your home and protect your roof against damage caused by ice damming and clogged gutters. Why Architects Still Love Copper Gutters? Copper Gutters are extremely durable and will last for decades. Copper resists corrosion. Over time it will change color as it ages. Copper adds value and beauty and sophistication to your property. 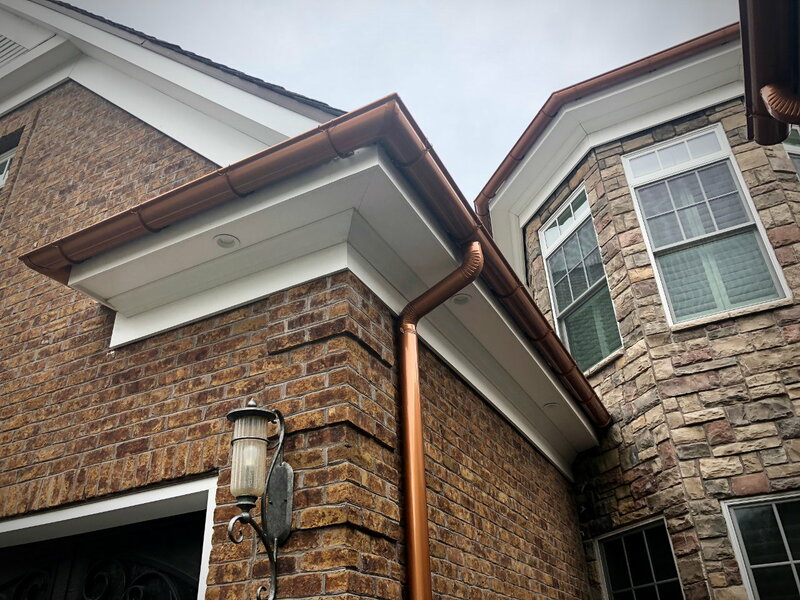 Copper Gutters are one of our many specialties! Gutters are the unsung heroes of a home’s exterior. When constructed from copper, this often overlooked detail becomes more than a rainy day standout. Copper gutters installed by “Creative Siding & Seamless Gutters Inc” allow us to leave the realm of utility and enter the arena of architectural detail. Most copper gutter jobs are custom, allowing plenty of room for creativity. Our skilled craftsman will customize the downspouts and catches to personalize your home. With each passing year, copper reaches new levels of architectural detail. With a quality installation, people passing by a home will stop and take notice. We have copper gutters in all shapes and sizes, from k style to half round, and high back to custom fabricated. Contact “Creative Siding & Seamless Gutters Inc” today to schedule an estimate for gutter installation at (631) 737-0811.